(Host) All the towns that hold their town meetings next week will vote on municipal and school budgets and other local issues. And many towns are also taking up the hot-button issue of corporate personhood. But some say it has no place at their meetings because it is a national issue and they’ve got plenty else to worry about at the local level. (Carapezza) Two years ago, the Supreme Court ruled in a 5-to-4 decision that corporations effectively have unlimited first amendment rights to spend as much money as they want on campaigns. Critics say that decision granted personhood to corporations. Now, largely in response to increased campaign spending, more than 40 Vermont towns have put a question about corporate personhood on their ballots. It asks voters whether they think their local government should urge Congress to propose a constitutional amendment that says "money is not speech" and that "corporations are not persons." In Essex, the Select Board has long blocked putting such questions on the local ballot. But a group of residents want to be able to weigh in. (Mason) "It’s always the same people who talk about the budget or the fire truck or whatever." (Carapezza) Katie Mason is one voter who would very much like to see the corporate personhood question on the Essex ballot. She says, as an active citizen, the Select Board’s effort to block it is frustrating. (Mason) "Town Meeting is like the basic unit of democracy and I think Citizens United is dismantling democracy." (Carapezza) And Mason thinks if the town allowed broader questions – questions that resonate beyond town borders – there would be greater participation. (Mason) "There’s just not a lot of freedom to talk about anything that’s not directly on the agenda or on the ballot." (Carapezza) Senator Bernie Sanders, meanwhile, has been leading an effort to get Citizens United on Town Meeting Day ballots across the state because he says our country is already witnessing the effects of the 2010 decision. (Sanders) "This is no longer a theoretical argument. What you are seeing in the Republican presidential primary, what you’re seeing now in senate races around the country are billionaires and corporate leaders pouring millions and millions and millions of dollars into campaigns. If anyone thinks that this is the end of the process – or this is as bad as it will be – you are mistaken. This is the tip of the iceberg." (Carapezza) But Sanders says he understands that some towns reserve the right to only accept ballot items that deal with town business, steering clear of national and international issues. (Sanders) "On the other hand, I do believe very strongly that communities do have a right to become engaged and give their opinions on some of the monumental issues facing our country." (Carapezza) In order for the Supreme Court decision to be overturned, it would take the approval of two-thirds of the U.S. House, two-thirds of the Senate and three-quarters of the states. That’s a tall order, regardless of what Vermont voters say on Town Meeting Day next week. Nearly a year after many Vermont towns supported resolutions calling for the reversal of the Supreme Court’s Citizens United decision that gave corporations the same rights as people, a new grassroots effort plans to expand the idea by giving the Earth "rights." 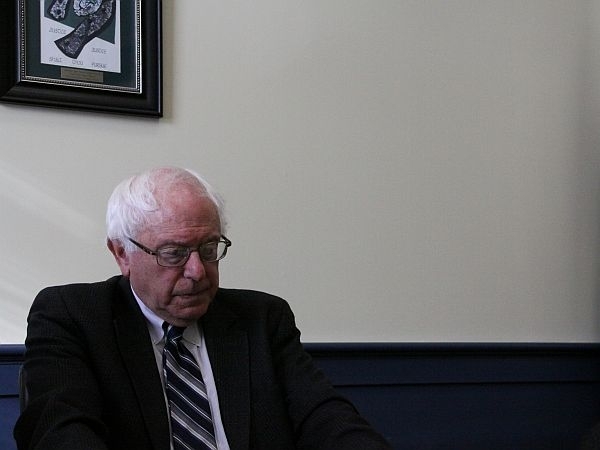 We talk to Sanders about gas prices, which have been notably higher in northwestern Vermont, Citizens United, FEMA Irene reimbursements, the recently passed Transportation Bill, which provides about $464 million to Vermont, and gun control, in the wake of the shooting in Aurora, Colorado.